Working, shopping, handling money, eating on the go and using public loos can leave our hands vulnerable to germs. Halo hand wipes give an immediate anti-bacterial cleanse, leaving hands fabulously fresh, clean and, because they have an added moisturiser, soft too. 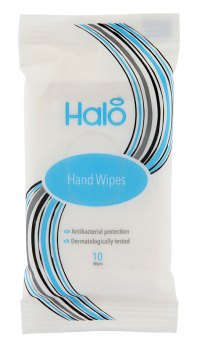 Halo hand wipes provide an instant refreshing solution when you are out and about and soap and water isn’t an option. Dermatologically tested, Halo hand wipes, which come in handy packs of ten, are your ideal travelling companion: convenient, easy to use and kind to the skin. Whether on a night out, a day trip or simply going about your day-to-day business, our hand wipes provide reassurance and are an essential item for your handbag, pocket or desk drawer.